The self-storage building boom appears to have reached an impressive financial milestone. Talonvest Capital Inc., the California self-storage financial adviser and mortgage broker, reports that lenders are now offering extremely attractive bridge loan deals to developers who want to get out of their original construction loans earlier than anticipated. Traditionally, bridge loans have loan-to-cost ratios of about 75 percent to 80 percent, meaning lenders will let developers borrow up to that percentage amount of the total cost of constructing and opening new self-storage facilities. Bridge loans are typically temporary financial tools that developers use until they can negotiate permanent post-construction loans. With a record level of new deliveries coming to market, some merchant builders are left operating facilities longer than expected while they market their facility. Bridge loans are appealing to developers for a number of reasons. Unlike original construction loans, bridge packages are no-recourse loans that don’t include personal-guarantee clauses for developers on loan repayments.Additionally, bridge loans allow developers to more quickly pull out their own equity from projects, freeing up money to pursue other development deals. “Many borrowers want these bridge loans so they can pursue other investment opportunities,” said Sherlock. Many types of investors are now offering bridge loans to self- storage developers – global investment firms, debt fund companies and even some private equity firms – reflecting the growing popularity of the self-storage industry among investors, Davies said. facility in Wicker Park, Chicago. 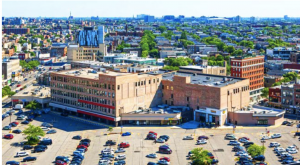 John S. Mengel, president of JSM Venture Inc., an Illinois-based self-storage owner and developer, said his firm recently worked with Talonvest Capital to secure a $25.25 million bridge loan (with a “near 100 percent” cost ratio) for a newly constructed self- storage facility in Chicago’s Wicker Park. It was his firm’s first bridge loan – and it may not be its last. “It’s all a new world for me,” Mengel said of bridge loans. “It was an exciting and interesting process.” He agreed with Talonvest’s Davies and Sherlock that a big plus of bridge loans is that it allows firms to pull some, or all, of their equity cash out of construction projects, freeing up money to pursue other deals. Mengel, Davies and Sherlock agree that high loan-to-cost bridge loans aren’t for everyone. When it comes to such loans, bridge lenders tend to like deals of $10 million or more – and with experienced developers building new facilities in prime locations. In the case of JSM’s bridge loan, Mengel said his new 111,000- square-foot facility, located in a shopping center, is in a “high barrier, A-plus” submarket of Chicago, making it very attractive to bridge lenders. “The location really fueled our bridge loan,” he said. “stabilization” level, that is acceptable to permanent-loan lenders, he said. More self-storage facilities are being built these days, increasing the competition for customers and lengthening the time it takes to fill up recently constructed buildings, he said. Thus, bridge loans are appealing, Baker said. With a bridge loan, his firm can be a little more patient when it comes to leasing up new facilities.